So, I got onto the escalator, leaned the handle of the pushchair as usual onto my chest…and you can see where it went wrong. Some hasty mid-escalator adjustments required, to stop the pushchair decapitating my little girl, and I ended up with the weight of the buggy (including Roo) on my shoulder. Not ideal. On the way back, we stayed on till Brixton (a whole other annoying story), so took the lift up but I *think* my alternate technique would be to step on first and hold the buggy behind me, maybe with me facing sideways. Don’t try this at home kids. Or if you do, don’t sue me. 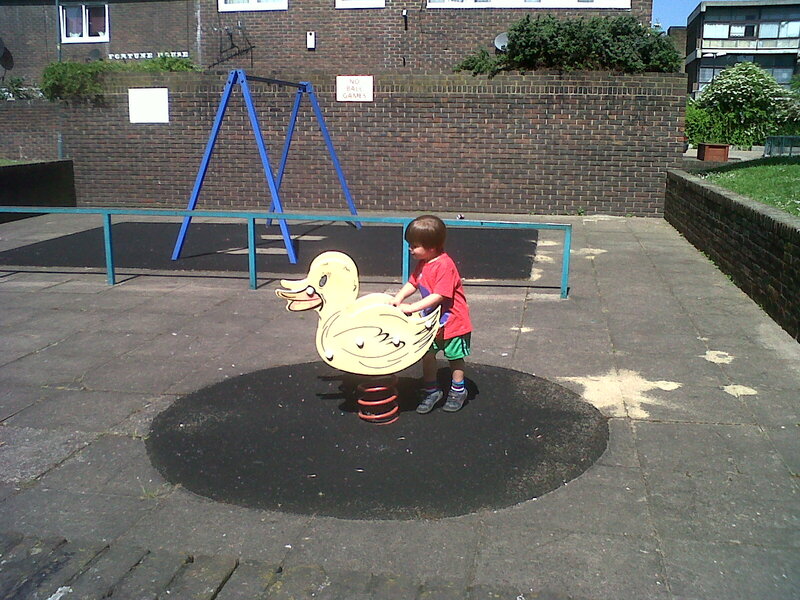 Yes, it’s a playground with only one working feature – a sinister but cheerful looking duck. Yes, that is a swing-less swing frame in the background. Yes, the Repairs Manager for the estate passed by and expressed his amazement that anyone would choose this playground when there were so many other parks nearby. But Roo wanted Ducky Park and Ducky Park only. I got a little off-topic here, but I guess what I wanted to say is that just because Roo disses something, it doesn’t mean there’s anything wrong with it. Boy just has no taste. Which brings us back to Lloyd Park, E17. A (very) random woman told us that the playground will be finished by the end of this month, having taken a year and a half to build. It will have sand and water features. There will be a cafe with grass on the roof. It will be awesome when it’s done. She is currently clearing out her loft. Only my cousin heard this last bit, as the rest of us had politely slunk away. But I have to agree with random woman – it will be lovely when it’s done. Just in time for winter! One bit that has been finished is the newly refurbished William Morris Gallery, on the edge of the park. (Look, I finally got there, after 550 words…). Bless them, they have tried very hard to make it child-friendly. It’s all accessible, it has baby changing, it has kids’ meals in the cafe and there are lots of hands-on bits. Pity the clientele looked disapproving at the sight (and sound) of a three-year-old in an art gallery. There were a lot of trendy East End types, with skinny jeans and ironic facial hair, and some old posh people and the atmosphere was quite subdued. Roo’s cousin Leo had just been woken up from his nap and so was quiet and grumpy and Roo was manically rushing around from room to room in search of a slide. In a different mood, I think the two of them would have had fun there. But neither were quite in the mood. So, what was there to entertain a 3-year-old? A surprising amount. 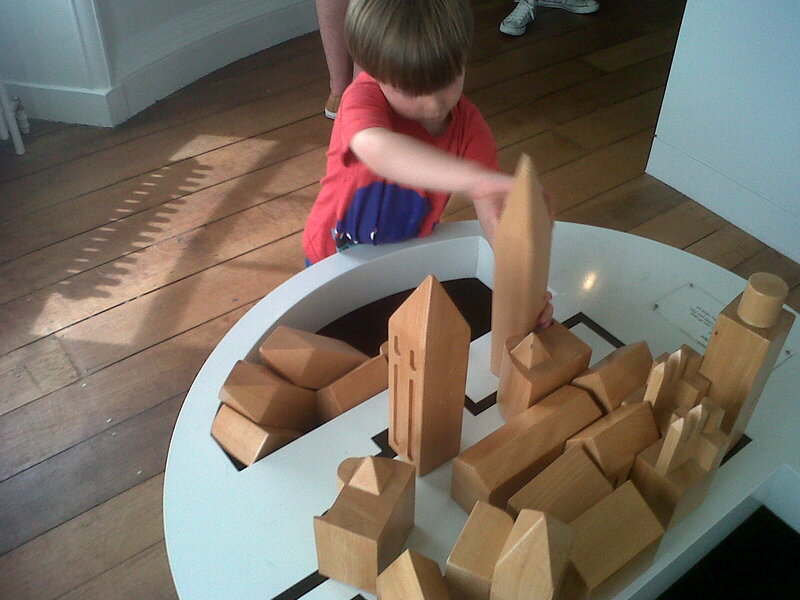 Blocks to build your own Cathedral. Brass rubbing. Dressing up (though we never reached that bit cause it was too.darn.hot for dressing up). 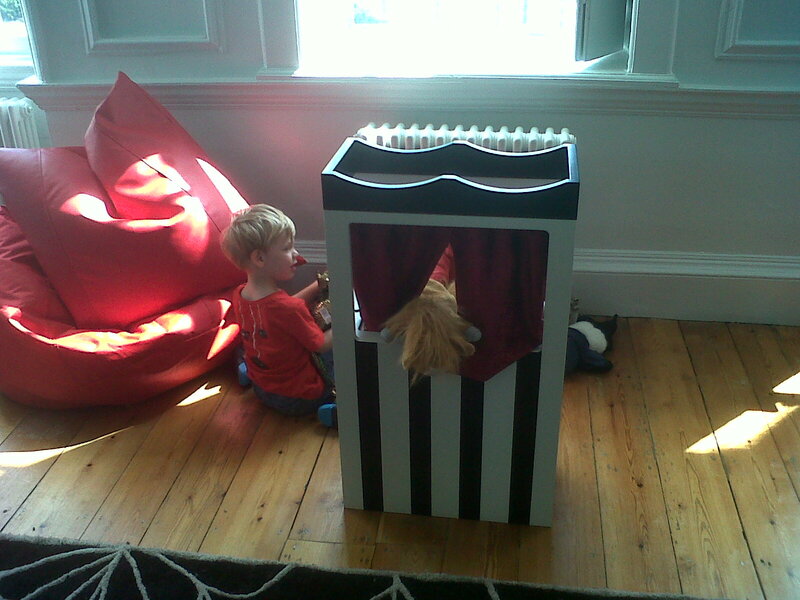 A puppet theatre, with beanbag chairs! On a rainy day, it would have been great. And for the most part, it’s light and bright and has beautiful huge windows. I would have liked more time to look round, as ever. I learned very little about William Morris, other than he had a penchant for all things medieval (he liked to go “a-rubbing”, apparently), and I had very little time to take in the HUGE Walthamstow Tapestry by Grayson Perry. But such is life with a crazy preschooler. I did notice the large and graphic representation of childbirth…cousin Leo had already had that one explained to him. Luckily, Roo didn’t notice it as he’s been a little *inquisitive* about all things biological since Eva was born. But no, he ran on by. 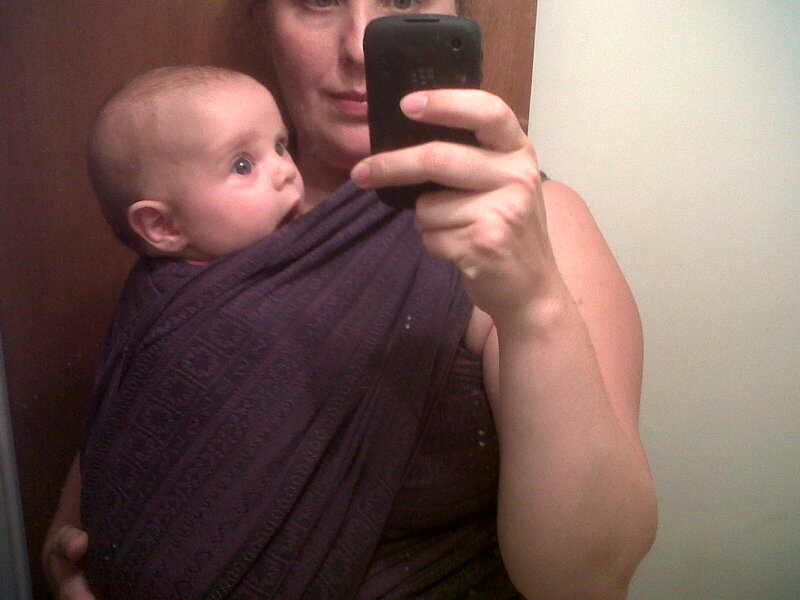 VERDICT: Good for a rainy day, as long as the toddlers aren’t too sugar-ed up. Probably not one for an insanely hot day in August. This entry was posted in Token attempts at culture (museums) and tagged art, East London, museums. Bookmark the permalink. Just an update to let you know Lloyd Park is reopening on Sat 15th September. ooh, just in time for our trip to the ‘stow on the 22nd!